FlickKey is a tiny virtual keyboard, which the creators say is the worlds smallest virtual keyboard, and uses just 6 buttons to provide all the characters on a full QWERTY keyboard. The six flick-able keys let you access 9 characters on each which are selected by pressing a key and then flicking it in the direction of the character you wish to select. If you need to select the centre character simply press and release the button. You can see the FlickKey keyboard application in action after the jump. FlickKey currently works on iPhone and iPod Touch iOS 4.0 and above and is equipped with English, and a generic International keyboard layout with support for more languages coming soon. 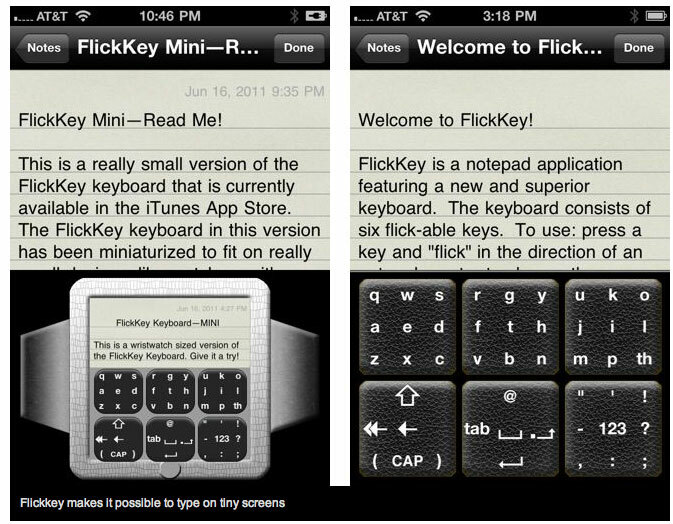 FlickKey is available to purchase on the Apple iTunes App store for $1.99.